This 118-story tower(高さ490m、地上118階建ての香港一高い) is the centerpiece of a master plan or massive reclamation project in West Kowloon. and an observation deck on the 90th floor. The office floors are generous in scale, with central cores. The hotel rooms occupy the upper levels of the tower, radiating from a cylindrical atrium topped by a swimming pool. A vertical city all by itself, the tower will be one of the tallest structures in the world upon completion in 2008. UNION SQUARE / above Kowloon Station is one of the newest developments in Hong Kong. The total GFA of this project is 1,090,026 square meters (11,733,040 sq ft) which is as large as the size of the Canary Wharf development in London. The Union Square project covers a total of 13.54 hectares. The built area includes 5,866 residential units totalling 608,026sq m, 2,230 hotel rooms and 2,490 serviced apartments comprising 167,472sq m of combined hotel/serviced apartment space and 231,778sq m of office space. Located at the MTR Kowloon Station with in town check-in facilities for Hong Kong International Airport, residents of Union Square have good transport facilities. This development will also feature an 82,750 square meter world-class shopping mall, Elements. - is the name of a residential project located in Union Square. The complex also goes by Kowloon Station Development Package 6 or Union Square Phase 6. The developer of the complex is Sun Hung Kai Properties. Both north and south towers of the The Cullinan complex, called The Cullinan North Tower and The Cullinan South Tower, will be Hong Kong’s tallest residential towers at 68 stories and 270 metres (886 feet). 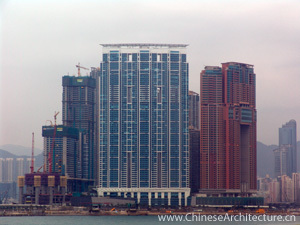 The project on this prime waterfront location will have glass curtainwalls and sweeping views of the Victoria Harbour. The glass facade will give the twin towers a futuristic image in line with the nearby International Commerce Centre. Kowloon Station Development Package 6 was named after the 3,106 carat (621.2 g) Cullinan Diamond found in 1905; the largest diamond in the world. The two largest polished gems from the Cullinan diamond are now mounted on the Sceptre and Cross and Imperial State Crown in the British crown jewels. The Arch (2005): 65 fl. 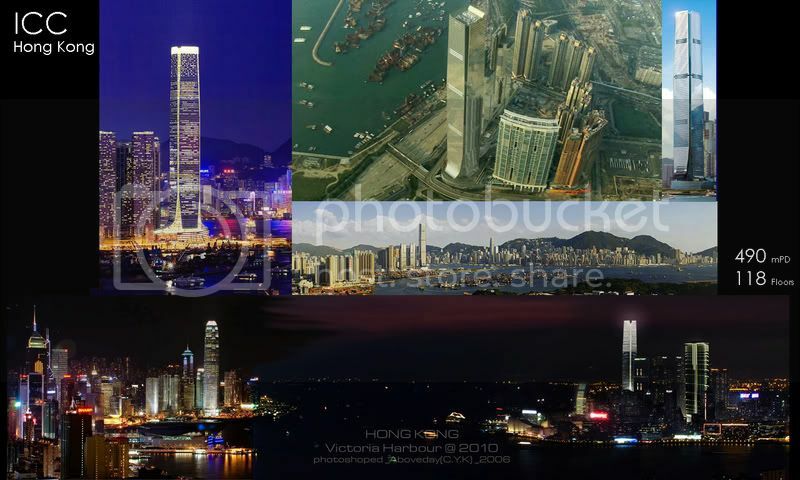 - is a proposed district of concentration for arts, cultural and entertainment establishments in Hong Kong, SAR. It is an ambitious and extravagant project led by several major developers, costing 25 billion dollars, to transform a piece of barren, waterfront reclaimed land, west of Yau Ma Tei into a futuristic artificial canopy. Currently in the public consultation stage, construction is planned in 2007 and expected to be operational in 2011. The project hopes to reaffirm Hong Kong's position as "Asia's World City", attracting tourists and foreign investments. However, there is currently a debate on whether the expensive WKCD project is in Hong Kong's best interests. Sun Hung Kai Properties (0016) bagged a prime seaview site in West Kowloon for HK$5.56 billion as it threw caution to the wind amid sluggish bidding from developers concerned about the high reserve price and the prospect of a judicial review related to the site. The price was 32 percent above the opening bid of HK$4.2 billion, but was at the lower end of market estimates. This was despite the Hoi Fai Road site offering a sea view, unlike another West Kowloon site, at Yan Cheung Road, which sold last month for HK$4 billion or 54 percent above the opening bid. In terms of accommodation value the Hoi Fai Road site, which was triggered for auction last month by Wheelock Properties (0049), stood at HK$6,066 per square foot, lower than the Yan Cheung Road site at HK$6,147 psf. An SHKP spokeswoman confirmed it had won the site as sole bidder but could not offer details such as the total investment required. Developers had mixed views of the final bid, with Peter Woo Kwong-ching, chairman of Wheelock Properties (0049), saying it was a good market price, while Cheung Kong (Holdings) (0001) deputy chairman Victor Li Tzar- kuoi commenting that it was quite high. ``The price is within expectation, although maybe at the lower range,'' said auctioneer Chris Mills, the Lands Department assistant director. The Lands Department also warned potential bidders before the auction that the Town Planning Board had received an application to lower the plot ratio for the domestic portion from 6.5 to 5 and to impose a height restriction on part of the site to allow better ventilation. ``The result ... was at the lower end of market expectations, mainly due to the recent legal issues,'' said Tony Chan Tung-ngok, executive director at Vigers Appraisal and Consulting. Centaline Property Agency research department associate director Wong Leung-sing reckoned the opening bid price was already very high, with reference to existing secondary market prices in the area. ``They are already very brave to go to this [final] price,'' said Wong, noting the very tight site, limited seaview and the possible judicial review. Midland Realty sales director for Kowloon Jeffrey Wai Man-chun said the accommodation value of HK$6,066 psf was about 20 to 30 percent higher than prevailing secondary market prices at Olympic station and would allow prices in West Kowloon to consolidate. Wai believes SHKP could sell the units at between HK$9,000 and HK$10,000 psf. 145 flats (out of 1,800 or so) sold in the first day at The Long Beach, in Olympic area. The Long Beach, another major development by Hang Lung Properties after The HarbourSide, houses 1,829 residential units in 8 high-rise towers. About 70% of the units enjoy harbour view. Typical units include 2-bedroom units of approximately 700 sq. ft. and 3-bedroom units of approximately 1,100 sq. ft. with a master en-suite and maid’s quarter. The development also features duplexes and penthouses of up to approximately 2,900 sq. ft. The Long Beach is situated across the road from the Olympic MTR station development, and just several minutes away from Central via MTR. Furthermore, with its proximity to the West Kowloon Expressway, travelling to the airport and the Mainland cannot be any easier. The Long Beach is destined to become the new focus of the Hong Kong property market. The sight of eight completed blocks standiung vacant on the waterfront at Tai Kok Tsui for three years has no doubt left residents in the area wonderinmg what was wrong with the 1,829 units in the development. The answer is nothing. Nothing, that is, except teh price target set for the development, known as the Long Beach, bit its developer, hang Lung Properties. Rather than release the units into a bear market for property for three years, Hang Lung decided to hang on until it judged the time was right to sell - a common strategy of developers caught in this dilemma. And now the time is right. + Low development costs had allowed HL to hold on. Apparently, they said that they would relaunch at "half the price of Cullinan". Big lenders (HSBC, Hang Seng, BofC) all cut their prime rates to 7%- lowest in two years. While StanChart, BEA, and Dah Sing cut to 7.25%. 48-55% above the prevailing prices in the area, where recent deals were hk$4,300 - 4,500.
prior to the closing in 2009, giving buyers 16 months to resell at a better price. prices by 10%- a response we have seen frequently in the recent boom. With a move-in date of 2011. JP Morgan, CLSA, and Deutsche bank are also reported to be in talks with owner, Sung Hung Kai Properties. The ICC Tower is expected to be completed in 2010, and there has apparently been a price rise. "The general feedback in the office is not really good," said one Credit Suisee staff member. ((Well that rather depends on where you live! Sure, if the wife and kids are set up in mid-levels on HK island, it will be longer. + Shortage of prime office space in central has driven up rents there by 20%. + With 110 floors (?) at ICC, that suggests room for 22,000 staff. .. to be launched in the next 6 months or so. 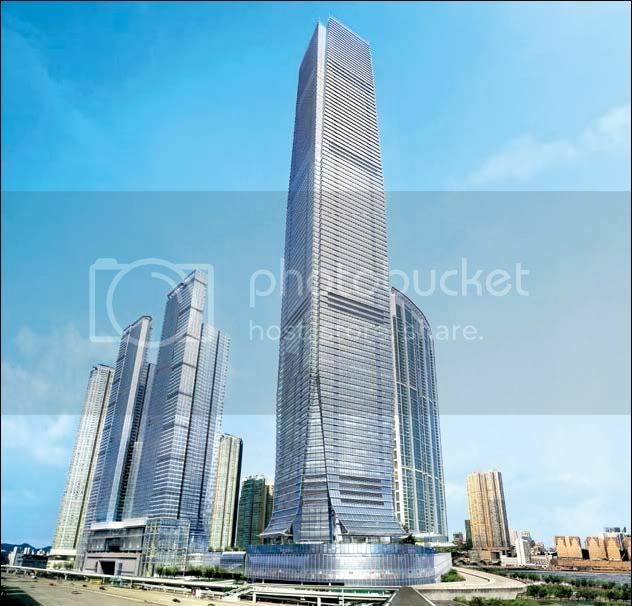 ICC project... ... 2.5mn .. : hk$ 50 psf : ?? 1/3? ...will be Hong Kong's latest distinctive landmark standing at a soaring 118-storey height (490 meter / 1608 feet) and facing Hong Kong's downtown on the Victoria Harbor. When complete, ICC will comprise of 2.5 million square feet (232 258 square meters) of Grade-A offices, a 1-million square feet (92,904 square meters) shopping mall, luxury residences and serviced apartments, and revitalizing green spaces - all accessible via MTR's new Kowloon Station. 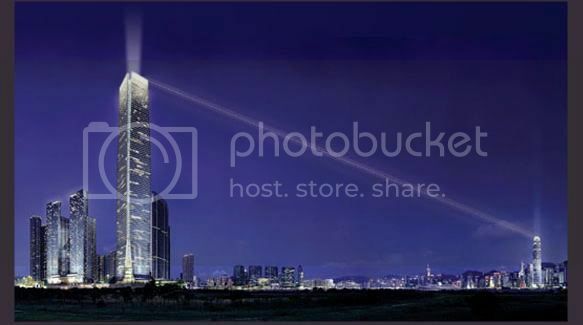 A 7-star Ritz-Carlton hotel with 300 rooms will be located near the top portion of the tower on 15 floors, and will be the highest elevated hotel in the world, surpassing the Hyatt in Jin Mao Tower - It will also include convention and conference facilities, and an observation deck on the 90th floor. The original design by SOM proposed a 574 meter high tower but it was rejected along with 2 additional tower design proposals - the client finally accepted the tower designed by Kohn Pedersen Fox Associates architectural firm in association with Wong & Ouyang. The tower is currently under construction in 3 phases; phase 1 in 2007, phase 2 in 2009, and phase 3 in 2010. Structural Engineering by Arup, MEP Engineering by J. Roger Preston, and Landscape Architecture by Belt Collins & Associates. Credit Suisse will move in mid-2008, at the latest. A US-based fund bought 42 units of The Long Beach in Tai Kok Tsui from Hang Lung Properties (0101) for HK$400 million, according to media reports. Henderson Land Development (0012), meanwhile, gained HK$500 million by selling 96 units in The Sparkle to the same fund. The Sparkle is located in Cheung Sha Wan, an old industrial district in Kowloon. Property agents said the traditional luxury market is changing as top homes are increasingly being snapped up by the Chinese new rich, who are pushing prices to the limit. Alibaba.com's (1688) Jack Ma Yun spent HK$300 million for a penthouse duplex in the Mid-Levels. The price tag set a record as the most expensive apartment in Asia. Hang Lung Properties chairman Ronnie Chan Chi-chung said liquidity has been accumulating in nontraditional economies, such as Middle East, because high oil prices are driving up the trading surplus. "But there are few investment opportunities there so they go elsewhere." Tony Tse Wai-chuen, general manager for sales at Henderson Land, said institutional investors choose Hong Kong as they are optimistic about Asia. They are worried about buying US homes because of the subprime crisis, while growth in the UK market has been slowing down after years of thriving on foreign investment. "Funds will commit to real estate in Hong Kong because of its political and economic stability, and it being a gateway to China," Tse said. The sustained weak trend of the US dollar, and thus, the Hong Kong currency too, is also causing the city's homes to become cheaper. Financial institutions prefer to buy whole blocks. When supply is short, as in today's market, they choose new apartments. Chan said unlike investing in stocks, institutions will not easily pull out when the market turns around. "It's difficult to sell dozens of flats at one go." ... URA's 25,000 sf site at junction of Pine st. and Anchor St.
... expected to fetch $1 billion: land price of $4,500, eventual $8,000 psf in 2 yrs. Island Harbourview .. 5,400 .. : .. 5,404 ..
Park Avenue.......... .. 5,041 .. : .. 5,843 ..
Hampton Place....... .. 4,692 .. : .. 4,864 ..
Central Park.......... .. 5,615 .. : .. 5,547 ..
OneSilversea........ . 10,048 .. : .. 9,356 ..
Others might be interested in a question that I received by PM. Are there good opportunities in Hong Kong Property for overseas investors? I travel to HK only once or twice a year. Would it be sensible to investing in a single top-end prime unit ? My assumption is that would be administratively easier than buying a portfolio of units. Would you agree ? I was looking at the Cullinan complex but the apparent price range ( Hkd sqft) seems very high for (perhaps ?) a non prime location. Is my view correct do you think ? Any alternative prime units due to be released this year ? all the way to mid-levels, and paying the silly prices there. be right for you. Let me explain my own logic, and then some alternatives that might work for you. you will be paying HK$20 million. That's: US$2.56 million, or Pds. 1.3 million. Big money for most folks. range ($4,000 - 4,500 psf by year end?) and maybe $5,000 psf for larger, combined units. + Longer term, extensions of the MTR and a bridge to Macau may make TC seem alot more central. there's good upside in the years to come. Unfortunately, the HK developers are well aware of how attractive these "soft finance" plans are to buyers. $5.75 million or more, and still rising each week (I hope), so on paper, I have doubled my 10% deposit. Other developers are getting even more aggressive on new properties than Hang Lung was at LB. that is expected in HK over the next year or so. you may not be able to see the flat. 5/ Another way that you can play the HK property market is by purchasing stocks with property portfolios. spoils with their shareholders. At a huge discount, it is a risk worth running as part of my portfolio. like this that invests in Berlin, and that is going well. So maybe it is worthwhile to set up something in HK too. investors, unless I am willing to put in my own cash for a minimum of 10% of the stock. or even: "It's all rubbish, I think its a blow-off", or whatever you like. I am thinking about backing a friend in setting up a HK property investment company. I would help with fundraising, and strategy, and maybe in identifying opportunities. I have already investing in a company like this that invests in Berlin, and that is going well. So maybe it is worthwhile to set up something in HK too. I have posted in Early Oct 2007 that I had done a S&P on a property in Hung Hom area in HK, which I could buy at a 5% discount to the existing market then, the transaction was completed by mid Nov 2007 and I have already got offers of upto 30% above what i paid for the property including the renovations as it was a second hand property. The market is becoming so tight in this area that prices are being pushed higher. There is a site in front of Harbour Place which the government is now going to put up for auctions and some property agents in Hung Hom area with who I now have build a very good rapport are saying that the price per Sq Ft will be very high, thus again driving the market in Hung Hom upwards. The new MTR spur line has been confirmed and it should be operational by 2014 and thus thats another boost to property in this area. I am planning to sell my property and this was a "Proof of Concept" transaction and am now in talks to set up the above mentioned HK Property Investment company. There are still good deals in HK property, espically second hand tenanted properties with short/medium term tenure which can be bought for bargains. Once the tenant moves out, all it takes is renovating the property and putting it in the market for a good profit. Another interesting venture, which is existing in HK is buying two adjecent flats and making it into a bigger flat which generates a big premium with increase in size of the property. A good example will be two flats of about 800 Sq ft bought at about 5500 HKD/Sq ft and once made into a single large flat, wherein renovations will cost about 300 HKD Sq ft and take around 70 days, can be sold at around the 7000 HKD/sq ft price thus giving appreciation of about 20%. I shall keep posting on developments in the near future. As the originator of the above mentioned PM first let me say thank you for your detailed thoughts. 1) I take your point about this block being the price leader for West Kowloon. In many ways that is why I am attracted to it. In the same area (union Sq) I read one post that said The Arch had sold units for $15,800psf for regualar apartments and for $33,500psf for a Penthouse. I would imagaine that the Cullinan could be expected to be priced at a 30% premium to adjacent apartment blocks which gets you somewhere close to the 20k-40k numbers. 2) I do like the sound of the West Kowloon area as a counter weight to Mid levels & Peak. If Long Beach (Olympic) will open up again at $10,000psf does that sound expensive versus The Arch at $15,800 psf or you think the proximity to ICC is not such a problem ? With respect to TC, the pricing seems competitive as a suburb but I dont know the area so I will continue my research. 3) So if I understand the example the extra 5% is analagous to the cost of an extended option ? ie if the market does not perform after 6m you can walk away with 5% loss as opposed to 10% loss with the usual funding option. 4) This I like the sound of but do not have the local expertise. 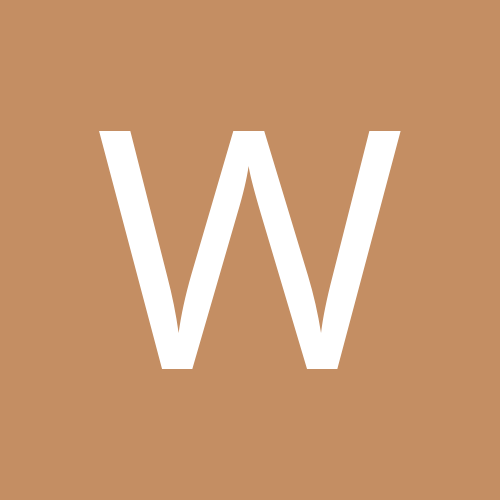 I have read the next post and am interested in that scheme. See my answer to point 6 below. 5) Yes agreed, I paid 79c a month or so back (thanks to your thread). - what sort of leverage would you expect ? - what would you say would be its benchmark ? - what would be the timeframe, realisticly, to get started ? 7) If I may now just ask some generic questions pertaining to a standard HK purchase. - whats the typical costs of BTL ie stamp tax, agency & management fees? - on new builds do they offer a full letting service ie furnishings ? Or do HK properties typically let unfurnished ? - whats the standard mortgage rate now being offered ? (The better flats, larger and with better seaviews will be released at LB in the next round- or the one after that. I suppose there will be a logic to such pricing, but the community will be less developed that mid-levels, so it is a risk. You have o see TC with your own eyes, to assess whether you agree with my that it has high potential. - on new builds do they offer a full letting service ie furnishings ?
. you can rent out furnished or unfurnished, Unfurnished is less hassle, but yield a bit less. We have had tio ove furniture out of a partially furnished flat, creating some extra hassle for us. Currently HSBC charges: Prime (6.75%) less 2.75%, so that's 4.00%. floating. Build costs here are probably: HK$1,500 psf: say US$200 psf. What is really expensive is the land, which is very scarce, expecially in Central HK. Hence the need to find cheaper land and connect it by public transport. into a new town of over 150,000 people, with more coming as it develops. As mentioned in a prior post, Lantau island is an ecological paradise in some respects. within easy walking and hiking distance. How can costs be so cheap in the US? Must be cheap materials, and low cost labor where you are. Any manufacturing there? actual US property within 2009. I am leaning towards Florida, and pondering where else to buy. "Buyers hoping for more usable space on offer at units in the Harbour Place project in Hung Hom will be disappointed". Maybe they should call it: Harbour-no-space ?? ....which ranges from $17,135 psf (1026sf- Bl.2, C.8) to $20,881 psf (Bl.1, A-12) These dont look particularly cheap to me, but I did hear from another agent, than a "mediocre" property in The Arch- lower floor, no seaview- sold this past week for $18,000 psf. "We are delighted to introduce 10 prestigious apartments in The Harbourside at 1 Austin Road West, Hong Kong. Unit sizes range from 1,065 sq.ft. to 1,463 sq.ft., with asking unit prices from HK$14,000 to HK$17,000 per sq.ft. All properties are strategically located above the 30th floor enjoying the most remarkable panoramic views of the Victoria Harbour."